The Central Intelligence Agency - some of whose staff are reported to have been in the convoy attacked in Gaza on Wednesday - has a long history of involvement in the Israeli-Palestinian conflict. The agency's operatives have had open contacts with the Palestinian officials since the mid-1990s. In the current intifada, the CIA is one of the main communication channels between Israeli and Palestinian officials. The CIA's main formal activity is to monitor the compliance of both the Israelis and Palestinians with the terms of the "road map" - a peace process sponsored by the US, Russian, European Union and United Nations that is now in tatters. Palestinians have often argued that American involvement in the Israeli-Palestinian conflict is heavily biased in favour of Israel. Wednesday's attack on an American convoy is believed to be the first time US officials have been killed in the West Bank and Gaza. In 1996 the CIA's station chief in Tel Aviv started hosting meetings between Israeli and Palestinian security officials in an attempt to build up security co-operation between the two sides. 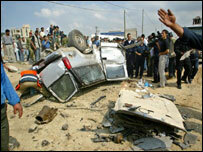 It has taken the leading role in organising and now reforming the various Palestinian security services. The agency funded the building of the Palestinian security headquarters in Jericho and Ramallah. It is known to have offices in the Gaza Strip, Ramallah, Nablus, Jericho and Hebron. The agency's role includes monitoring the Palestinian security services' attempts to stop operations by militants and oversee Israeli troop pull-outs. The CIA is believed to be involved in surveillance over militant settlers in the West Bank. CIA operatives often try to settle disputes between Israelis and Palestinians on security matters and border checkpoints. 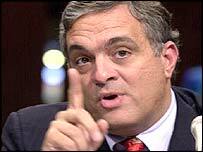 Its director, George Tenet, has visited Israel and the Palestinian territories on several occasions. In June 2001, he brokered a ceasefire agreement that was meant to launch a new peace process. There has been criticism in the US of the CIA's overt presence in the Palestinian Territories and Israel. The fear is that its more traditional job of covert intelligence gathering will be compromised by policy interests. According to some reports, the CIA's involvement in Palestinian affairs goes back much further than the mid-1990s. In the 1970s Yasser Arafat is said to have opened a communications channel with the CIA, with the approval of the White House. The CIA was also instrumental in brokering the deal that allowed the Palestine Liberation Organisation to evacuate from Lebanon to Tunis in 1982.